Stomach, Glandular stomach, Epithelium - Hyperplasia, Atypical in a female B6C3F1 mouse from a chronic study. There is an expansile focus of hyperplasia within the mucosa (arrow). Stomach, Glandular stomach, Epithelium - Hyperplasia, Atypical in a female B6C3F1 mouse from a chronic study (higher magnification of Figure 1). 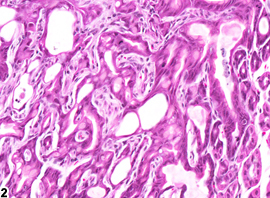 The epithelial cells within this hyperplastic focus are pleomorphic. Glandular stomach lesions are quite rare in NTP mouse studies. In the stomach, the principal features of atypical hyperplasia include cellular atypia, abnormal differentiation, and disorganized mucosal architecture. Cellular atypia is characterized by nuclear pleomorphism, hyperchromasia and stratification of nuclei, increased nuclear-cytoplasmic ratio, and loss of cellular and nuclear polarity. Abnormal differentiation is distinguished by reduction or alteration in the normal secretory products of the mucosa. The features of disorganized mucosal architecture include irregularity of crypt structure, "back-to-back" glands, budding and branching of crypts and intraluminal, and surface papillary growths. 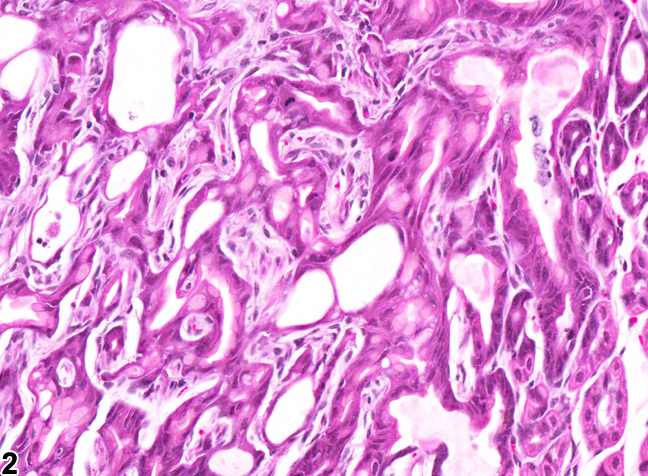 Atypical hyperplasia can be found in the glandular stomach of rats treated with carcinogens. Atypical hyperplasia is diagnosed and graded based on the degree of proliferation, disorganization, and atypia of the glandular epithelial cells. When atypical hyperplasia is diagnosed, the atypical features should be clearly described in the pathology narrative. Associated lesions, such as necrosis and inflammation, should be diagnosed separately. If the hyperplasia is thought to be secondary to necrosis or inflammation (e.g., regenerative), this should be made clear in the pathology narrative. Hirose M, Wada S, Yamaguchi S, Masuda A, Okazaki S, Ito N. 1992. Reversibility of catechol-induced rat glandular stomach lesions. Cancer Res 52:787-790. Johnson JD, Ryan MJ, Toft JD II, Graves SW, Hejtmancik MR, Cunningham ML, Herbert R, Abdo KM. 2000. Two-year toxicity and carcinogenicity study of methyleugenol in F344/N rats and B6C3F1 mice. J Agric Food Chem 48:3620-3632. Morson BC, Sobin LH, Grundmann E, Johansen A, Nagayo T, Serck-Hanssen A. 1980. Precancerous conditions and epithelial dysplasia in the stomach. J Clin Pathol 33:711-721. Nagayo T. 1981. Dysplasia of the gastric mucosa and its relation to the precancerous state. Jpn J Cancer Res 72:813-823. Streett CS, Cimprich RE, Robertson JL. 1984. 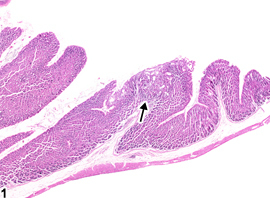 Pathologic findings in the stomach of rats treated with the H2-receptor antagonist tiotidine. Scand J Gastroenterol Suppl 101:190-117. Tsiftsis D, Jass JR, Filipe MI, Wastell C. 1980. Altered patterns of mucin secretion in the precancerous lesions induced in the glandular part of the rat stomach by the carcinogen N-methyl-N-nitrosoguanidine. Invest Cell Pathol 3:399-408.